Viceroy is a low-cost cigarette brand owned by London-based British American Tobacco. Viceroy cigarettes are made by Brown & Williamson (B&W), an American tobacco company which was bought by British American Tobacco (BAT) in 1927. 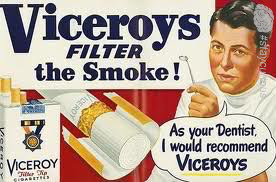 Viceroys were first produced in 1936; the first filter cigarettes with a cork tip. Don't forget to check out our Kickstarter Campaign! If you love Curionic pledge what you can! Even a dollar and a share helps!